You Are Here: Home > Where Can I Find Toyota Service near Me? Where Can I Find Toyota Service near Me? When it’s time for Toyota service, we hope you turn to LeBrun Toyota. Our Toyota dealership near Palmyra, NY, has a fully equipped Toyota service center where you can bring your prized Toyota RAV4, Camry or Tacoma in for Toyota service. From extensive Toyota repairs to routine Toyota maintenance, the team of technicians at LeBrun Toyota will care for your vehicle like it’s their own. Regardless of what you need, our Toyota service center near Palmyra, NY, will help you get back on the road with a like-new vehicle as soon as possible. We can take care of Toyota oil changes, tire rotations and wheel alignments in no time at all. When you stop by for Toyota maintenance, we’ll also check your vehicle’s fluid levels and top off the transmission fluid, windshield washer fluid or any other solution that’s low. And if your Toyota Corolla or Highlander needs brake service, we’re here for that, too. You’ll leave feeling confident that your Toyota brake pads, rotors and calipers are in tip-top shape so you can remain safe on the road. 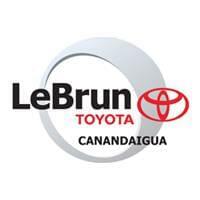 Whether you’re looking to order genuine Toyota parts, stop by for Toyota maintenance or schedule Toyota brake service near Palmyra, NY, LeBrun Toyota can take care of you. Schedule a Toyota service appointment online, give us a call or drop in when it’s convenient for you!